(2017/Music On Vinyl) 28 tracks. The pop world lost one of the most important soul singers ever to grace the world on 1st April 1984. Marvin Gaye has left behind a series of fantastic hits plus a big handful of tracks which deserve the title of masterpiece, all 'Collected' on this album. Geboren am 2. 4. 1939 in Washington D.C. als Marvin Pentz Gay Jr. Spielte mit Don Covay bei den Rainbows, später mit den Marquees. Ab 1960 arbeitete er für Motown Records abwechselnd als Sänger und Schlagzeuger bei diversen Sessions, Z. B. für Little Stevie Wonder. Wurde Duett-Partner u. a. für Mary Wells, Kim Weston und Tammí Terrell. 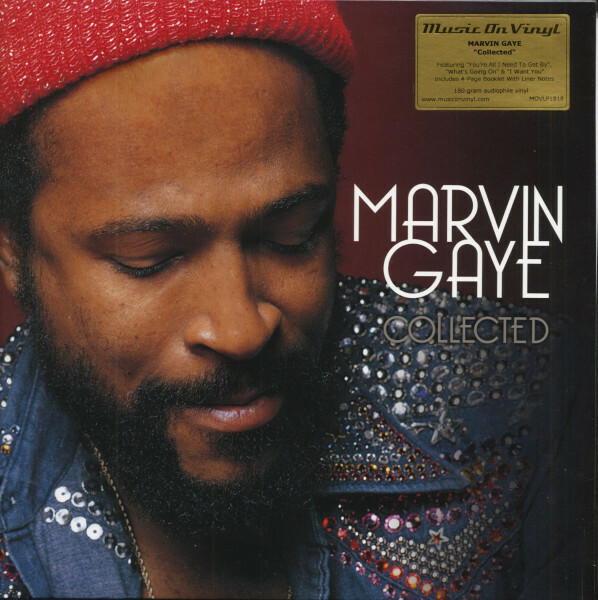 Weit über 50mal platzierte Marvin Gaye sich in den US-Charts. Zu seinen größten Hits gehören 'I Heard It Through The Grapevine', “Inner City Blues' und (erst 1982) 'Sexual Healing'. Mit seinem Vater, einem Geistlichen der Apostolischen Kirche, lag Marvin Gaye häufig in Glaubensfragen über Kreuz. Am 1. 4. 1984 wurde Marvin Gaye von ihm erschossen. In den Jahrzehnten zuvor war der Top-Star in amerikanischen Kinofilmen wie 'The Big Beat' (dto., 1965) und 'Chrome And Hot Leather' ('Chrom und heißes Leder', 1971) dabei. Once he hit his full stride at Motown, Marvin Gaye was proving unstoppable. His personal hit streak commenced in 1962 with the aptly titled Stubborn Kind Of Fellow (Gaye had resisted singing commercial R&B initially at Motown, preferring to croon old standards), then went into overdrive the following year with Hitch Hike, Pride And Joy, and Can I Get A Witness, and in '64 with You're A Wonderful One, Try It Baby, and Baby Don't You Do It. He was also proving a fine duet foil, scoring hits alongside both Mary Wells and Kim Weston. 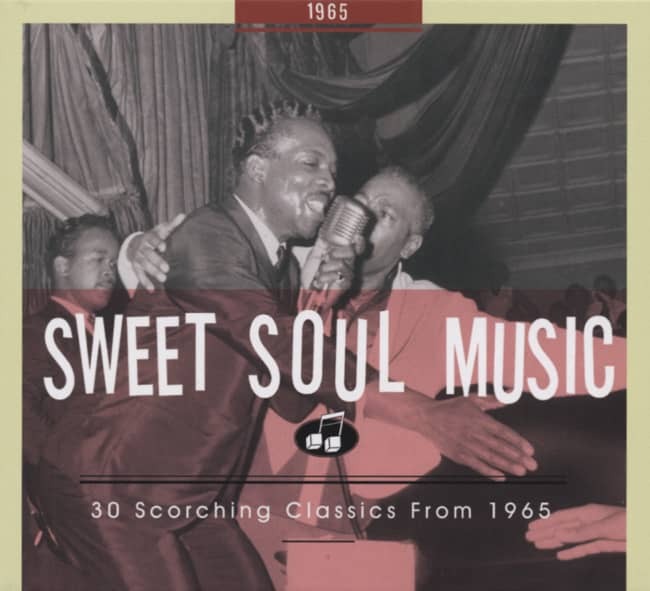 Holland-Dozier-Holland started 1965 off memorably for Marvin with their glorious How Sweet It Is (To Be Loved By You), a #4 R&B/#6 pop blockbuster. "The key, he thought, was too high," says the song's co-writer and co-producer Lamont Dozier. "If you put Marvin in a situation where his back was against the wall, meaning that the key was a little high, he would come up with stuff that you couldn't write on paper, as far as his performance was concerned." 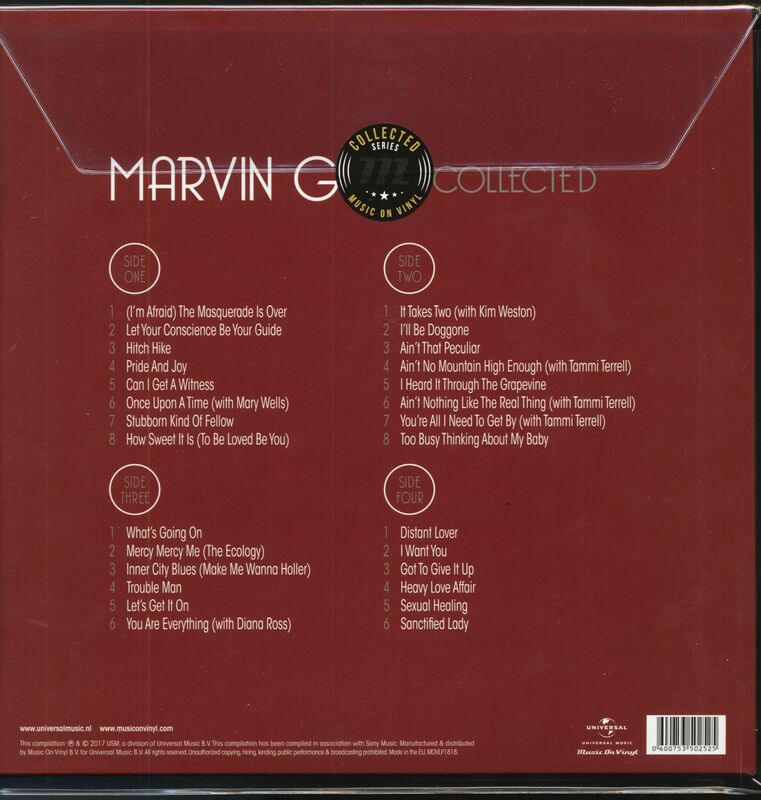 Marvin's endlessly prolific pal Smokey Robinson produced his next smash, the sleek I'll Be Doggone. Written by Smokey, Miracles bass singer Pete Moore, and their guitarist Marv Tarplin, it vaulted all the way to the top of the R&B charts and made it to #8 pop. Constructed around a tough rhythm guitar figure and spiced with crackling bongos, a mixed vocal chorus, and swirling strings, I'll Be Doggone was chock-full of sly Robinson lyrical twists and turns that rendered the tune a pure delight. "The music was primarily done by Marv Tarplin," reports Moore. "He was the one that came up with the original riff. Once we heard it, then Smokey and I put the lyrics to it." Before the year was through, the same creative triumvirate, abetted by fellow Miracle Bobby Rogers, would come through again for Marvin, handing him another number one R&B smash, Ain't That Peculiar. Customer evaluation for "Collected (2-LP, 180g Vinyl)"